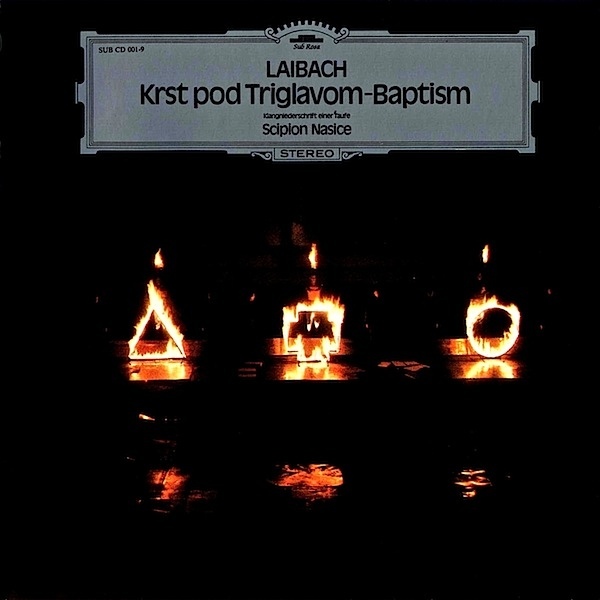 Laibach's reason for existence has always been an exploration of extremities, but in many ways the group rarely got more extreme than on the soundtrack for the massive Neue Slowenische Kunst stage production Baptism, or Krst Pod Triglavom -- Baptism Below Triglav in full. Triglav itself is Slovenia's highest mountain, while the baptism in question refers to a historical battle between Slovenian pagans and invading Germans who won the day and forcibly converted the losers to Christianity. The parallels between that and more recent examples of military and cultural invasion are not merely obvious but fully intended. Numerous photos of the production are included in the album packaging, showing a compelling design making equal reference to medieval imagery, fascist stylings and Weimar-era experimentalism -- arguably the music and art had rarely been so appropriately matched. That music itself was the most ambitious the group had yet recorded, something which could appeal to the classical music aficionado as much as the industrial/experimental wing, while the humor is of an extremely rarified nature -- a collection of Beatles and Rolling Stones covers this isn't. Wagnerian opera is unsurprisingly a chief reference point, though the group focuses on a mantra-like repetition of musical and lyrical phrases, doubtless the better to draw the parallels to unthinking fascist reactions. Not everything is strings and horns, admittedly -- sometimes it can be as simple as a looped beat and chant with the occasional vocal bark of "Raus!" What sounds like crowd samples and possibly political speeches get mixed with metallic sound snippets and even acoustic guitar, while more than once the band just bodily dropped in extended performances from other operas entirely! With sly, bitter hilarity, Baptism is packaged in an obvious knockoff of the Deutsch Grammophon in-house style for its run of classical music releases -- another example of German cultural colonization, one could argue.